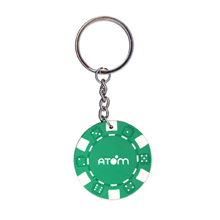 This keychain is sure to make a nice giveaway or gift for any casino, hotel, or poker tournament. 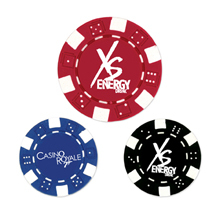 Lightweight and only 1 1/2" dia., these chips come in three colors: Black (S16366X), Blue (S16365X), and Red (S16367X). One color/location imprint only. An odds on favorite! These colorful promotional products are perfect for taking anywhere. Measuring 1 1/2" they're an ideal giveaway at tradeshows, conferences and conventions. Casino guests can feel lucky to have such a valuable token. Can add to your key ring or attach to your purse as an adornment. Great for fundraisers or charity events, also. Available in green (S5581X) only. An odds on favorite! These colorful promotional products are perfect for any type of business, project, or event. 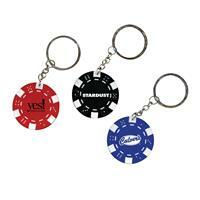 Measuring 1 1/2" they're an ideal giveaway at tradeshows, conferences and conventions. Casino guests can feel lucky to have such a valuable token. Use them as unique gifts at a bachelor's or retirement party. Choose from 3 bold color options, add your custom imprint and take a gamble. Great for charity events. Available in red (S5587X), blue (S5588X), and black (S5589X).